Automotive Accessories - Lift Kits, Hitches, Undercoating, Leveling Kits and much more! 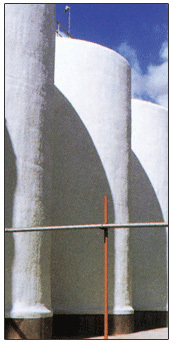 Polyurea coatings protect steel tanks from corrosion, chemicals, and other natural weather and jobsite elements. With proper surface preparation, substrate condition, formulation choice, primers, and installation procedures, polyurea goes on fast and stays on long. Polyureas are great for extending the life of older tanks and can offer limited structural characteristics as well. These systems can be applied during primary construction or in a retrofit environment. With their fast cure times they are ideal for retrofit since down time is significantly minimized compared to some competing materials. 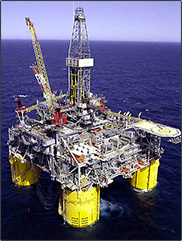 Bullet Liner's Polyurea Material's ability to maintain its physical characteristics under long-term sun and sea exposure and resist marine borers, makes it an ideal product for coating Naval and Industrial ships, piers, offshore oilrigs, and other marine applications. Polyurea manhole lining is a rapidly growing market due to polyurea’s ability to solve many current issues with groundwater infiltration and installation speed. 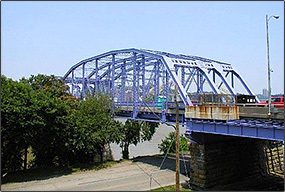 Many municipal and private water systems are in great need of lining and structural repair. With proper surface preparation and substrate conditions, primers and Polyurea can be applied fast to return the cavity to service faster than most competitive systems. Polyurea's ability to form a monolithic, durable liner protects the cavity from sediment and groundwater infiltration into municipal wastewater systems. Polyureas are commonly used to line liquid containment railcars for their waterproofing and chemical resistance benefits. Hopper style rail cars have benefited from the strength of polyurea and its ability to resist abrasion. These cars often carry coal, sand, and other abrasive materials. 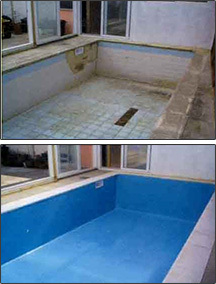 Polyurea can be applied quickly and it will last longer than many other conventional systems if properly applied. Bullet Liner's Polyurea is spray-on coating with high abrasion resistance, high chemical resistance, excellent durability, and excellent flexibility. Vendors and manufacturers have developed formulations to cover a very wide variety of requirements from extreme surface hardness to extreme elongation. Our job as coating system contractors is to determine all the specifics of your project and select the right polyurea and top coats (if needed). Fast cure time. Can support foot traffic in minutes. Very durable and abrasion-resistant. Wears very well. Resistant to many solvents, acids, and corrosive compounds. Many formulations available for virtually any application or need. Very wide range of thicknesses available in a single spraying. No VOC's (volatile organic compounds) released during application. Polyurea flooring systems are most popular for their rapid turnaround installation capabilities. 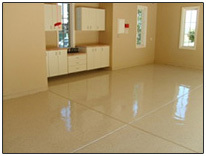 Other benefits are available with polyurea flooring systems as well. Polyureas are very durable and great for use in areas of high traffic. They are used in clean/dirty rooms as a waterproofing and protective coating from daily pressure cleaning operations. Polyurea can be formulated to be flexible and resilient allowing the flooring system to protect objects that may fall upon them. Aquariums, Ponds and Pools have also found benefits with polyurea. The ability to form to properly prepared custom shaped walls and themed ornaments make this system desirable. A spray applied, water resistant liner, available in a variety of colors with rapid return to service installation is why facility owners are turning to polyurea. Polyurea coatings make an excellent protective covering for polyurethane foam roofs. Polyurea can be formulated to meet specific performance requirements due the wide range of physical properties that can be formulated. Some systems have the "Cool Roof" ENERGY STAR® rating for color and reflectivity. These reflective coatings can help reduce the amount energy consumption buildings use for heating and cooling. The fast cure time and insensitivity to moisture allows for a quicker installation with a wider application window. Proper surface preparation and substrate condition is always necessary. Landscape designers and contractors have found similar benefits with polyurea. Polyurea is often used to contain water for ponds and pool decorations to form a primary containment liner. Use of geotextile material is common when applying polyurea over dirt. Proper surface condition is vital when applying over concrete and most other substrates. Bullet Liner of Columbus would be happy to answer all your questions and provide you with a free Quote tailored for your truck or project. Call us at: (855) 60-BULLET (855-602-8553) or use our confidential Contact Form.